Invati & Invati Men are Aveda’s solution to fine, thinning hair. Fortified with an invigorating blend of ayurvedic herbs the Invati range helps to energise the scalp and restore strength for thicker, fuller hair. For best results use the 3-step system. Damage Remedy repairs and protects against the 4 types of damage; environmental damage, heat damage, chemical damage and physical damage. Made with pure plant oils and quinoa protein the collection rebuilds and restructures hair, lending it new life. Featuring daily use products and deeply-nourishing treatments, Damage Remedy leaves hair touchably soft and stronger. Dry Remedy nourishes and moisturises dry, brittle hair. 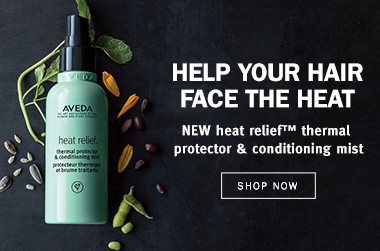 Made with Aveda’s patented deep-moisture complex featuring buriti oil to deliver intense hydration. Scented with aromatic certified organic lavender, bergamot, ginger lily and pure flower and plant essences. Hair is drenched in moisturisation and left soft, supple and shiny. Be Curly helps curly girls (and boys) celebrate their true texture in all its glory. Treat hair to gentle cleansing and deep conditioning that increases shine and defines curls.The collection is infused with wheat protein and organic aloe blends that expands with wet hair, retracting when dry to define curl and wave. Organic baobab and babassu oil help seal, soften and moisturise to maintain your curls throughout the day. Color Conserve protects hair colour from fading, extending the vibrancy of colour-treated hair. Each product adds a dose of Aveda’s natural philosophy by using gentle, plant-based ingredients. Infused with Aveda’s own pure-fume aroma with certified organic lavender, geranium, grapefruit and pure flower and plant essences. Smooth Infusion is a line not just made to fight frizz, but intended to treat frizz from the inside out by re-surfacing and softening the hair. Their Smooth Infusion blend is enriched with aloe, maize, and guar bean to smooth and calm the hair by up to 60% with intended use, and includes styling products that polish and defend against humidity. Shampure is a line intended for use by any and every hair type, nourishing and fortifying the hair with natural proteins. Scented with Aveda’s calming aroma; a mix of 25 pure plant and floral essences including certified organic lavender petitgrain and ylang ylang. This is an ideal line for anyone looking for a calming, soothing option that revives any hair type. Pramasana is all about scalp health. Bring your scalp back to working order with lightly exfoliating wintergreen-derived salicylic acid and plant-based soothers. Pramasana is ideal for anyone with a flaky, irritated scalp looking to soothe and cleanse. Rosemary and Mint, one of Aveda’s signature aromas awakens the senses and your hair. Certified organic Rosemary and peppermint gently cleanse and invigorate the scalp leaving fine, flat hair healthy and full of body. So check out the options below to find the perfect line for you! Mix and match to create your perfect routine from Aveda’s wide range of professional, high-performance options. Showing 20 products of 78. It took about 25ml to completely do one treatment with this in my hair (1/4 bottle) and I have medium length hair that is not thick but not thin. Which didnt bother me too much because I will get 4 treatments out of it. It definitely made my hair feel moisturised. I didnt notice huge changes but I found it worth it. I just use this in between olaplex treatments now. I have to admit when this first arrived I laughed at the size of it because it was almost the same size as one of the samples I got with my order. I have medium length hair that is not thick and this tube (25ml) only just covered all my hair. Someone with thick or long hair would probably need two of these! I left it in for about 10 minutes and washed out. I was happy with the product it left my hair feeling really nice and silky and moisturised afterwards. I think it would have had a better affect after a few more treatments. No dramatic changes in just one wash which is understandable. I think next time I would spend the extra to get a bigger size because I dont think I would pay $15 again just for one treatment. I have used this conditioner for a good amount of time and it has not done anything different to my hair. If anything the be curly shampoo and conditioner has made my hair so dry to the point of j now get dandruff. I have very curly, frizzy hair and was recommended these products by the Aveda staff, it has not made my hair conditioned and i found it didn't come out of your hair very easily. I would not recommend this product to anyone.